Fun, fun, fun tonight - at least in the first half of the show with funky music from Eric Ness and his accompanists Henrietta, Ryan, Joseph and Sam. Amazing that we fitted all these people into a tiny space along with flute, guitars, mandolin - and a huge double bass!! The studio rang with the ecstatic sounds made by this talented crew from Norway, Sweden and England via London. And craziness ensued. On The Radio, All The Things You Are, Take Me and I've Been Bad. 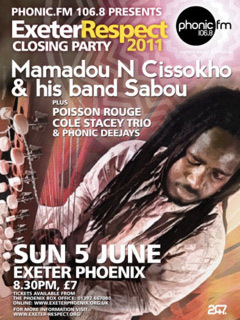 ...entertains us on Monday 2 June on rootsandshoots. Not to be missed! Check out his music here. Post script: I do hear tell that Eric is bringing an entourage of accompanists. How we will fit them all in I don't know but we will. Listen in to find out how we fair. 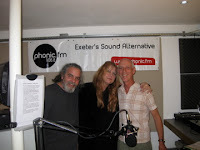 A-capella band Cockahoop brought their beautiful harmony singing to the Phonic FM studio for tonight's rootsandshoots. They sang The Boggart, The Kye, An Old Man Came Courting Me and Words Can Save Us. Catch them at festivals over the spring and summer. Find out more about them on their myspace page. for playing some of his own songs for us this evening: As Ghosts Reveal and Close At Hand. Superb singing and guitar playing! Good to hear about the background to the songs too. Long Way To Go and Life Tourist. Both are due for release soon. Check James's website to find out more about his music including news of new releases. His gigs are also listed there. One we'll tell you about, because it's local, is The Double Locks on Saturday 25 June at 18:00. Artwork from James Hollingsworth's website. 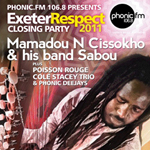 Poisson Rouge are performing - along with Mamadou N Cissokho and his band Sabou and the Cole Stacey Trio - at the Exeter Respect After-Party presented by Phonic FM at Exeter Phoenix on Sunday 5 June. More info here. 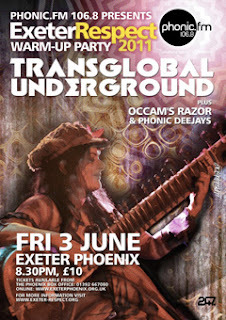 Transglobal Underground are headlining at the Exeter Respect Warm-up Party presented by Phonic FM at Exeter Phoenix on Friday 3 June. Details here. James Hollingsworth was one of our first guests when rootsandshoots began. 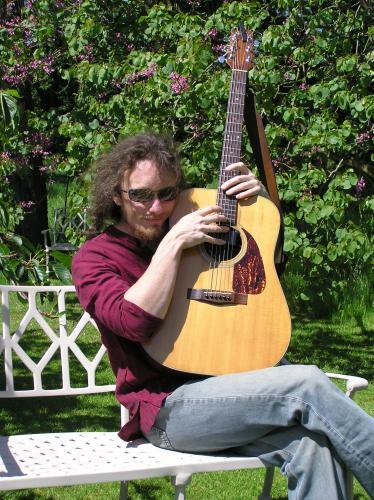 He has an amazing singing voice and a unique, complex guitar style. 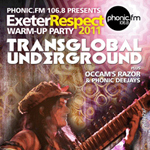 We are delighted he's paying us a return visit - this Monday 16 May. 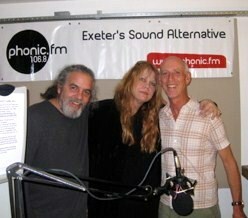 Lots of guests in the studio tonight and it was all great fun - at least I thought so! Samba Band - who began in Exmouth, it seems. 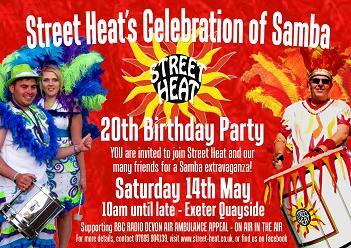 They are celebrating their 20th Birthday at Exeter Quay from 11:00 this Saturday 14 May with their Celebration of Samba. They will be parting with other south-west sambistas (a new word for me!). Ain't Gonna Run, Exeter Town (written by Sarana after her visit last year when she fell in live with Exeter; yes, she does know it's a city! ), Wind Through the Pines, Thirteen Days and Bats And Butterflies. We had a chance to compare the latter with the recorded version played earlier. The versions were both very good and quite different! Many thanks to all the excellent musicians. Thirty years since Bob died. His music and the legend lives on! Sarana VerLin and Billy Brandt. They play their own original blend of Celtic and American music: "Celticana". They have won numerous awards in the folk, country and rock categories. It's great to have them on the show. who are celebrating 20 years of playing samba. The start of Spring and International Workers' Day. We played a number of relevant tracks.